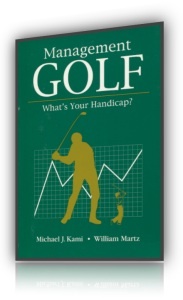 Amazon link: Management Golf: What's Your Handicap? The authors have been good friends for many years. They coauthored in 1979 the Strategic Planning Manual, which became a working tool for many companies, large and small. Both authors are top-management consultants with practical experience in diverse industries. They strongly believe in action-oriented planning, resulting in speedy execution and good things actually happening. They cringe at neatly bound reams of paper, full of promises but generating no constructive activity. The purpose of this book is to stimulate a serious and sincere evaluation of a company's operations by CEOs and key executives responsible for running the business of a homogeneous corporation or discrete divisions (business units) of a larger conglomerate. The authors wanted to make it an interesting experience, a fun exercise. 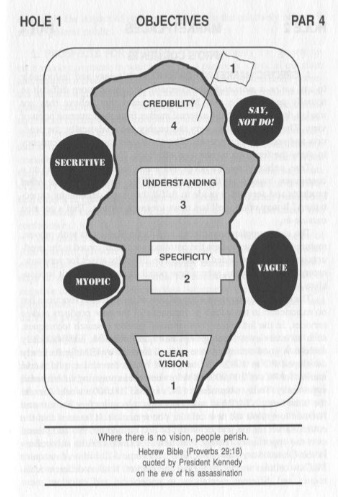 That's why the self-audit is designed as a round of golf with pars, bogies and birdies. Each hole of the 18-hole golf course represents a key area for the success of the business. How is it played today? How should it be played tomorrow? 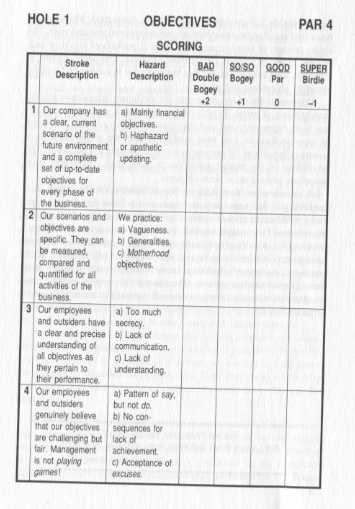 The authors hope that the evaluation doesn't stop with the calculation of the score and the computation of the handicap of one's company. The real objective is to stimulate interest, innovation and creativity to start new actions to run the business better. Management must become eager to reduce the handicap and consistently play better than par, at the top pro level, as a world-class operation. The authors are genuinely interested in improving the level of management efficiency and helping to create better operating results for the practitioners of this golfing experience. We hope you enjoy reading this book and that you'll use it to improve your business. Dr. Michael J. Kami was the chief strategic planner for two small companies that made good: IBM and Xerox during their super-growth years. He retired young and moved to Florida many years ago. But he couldn't just stand still. He became a one-man mini-conglomerate: a combination consultant, writer, public speaker, motorcycle rider, publisher, boats-man and entrepreneur. During the past ten years, he has served as a consultant on the board of directors of Harley-Davidson, during its successful transformation. He is considered one of the leading business advisers in the world and has been featured in many magazines and publications in the United States and abroad. He is knowledgeable, down-to-earth and tells it as it is. Peter Drucker and Tom Peters called him the best planner they know. His latest books, Management Alert: Don't Reform, Transform! and Management Golf: What's Your Handicap?, have become compulsory reading for managers. His quarterly publication Kami Strategic Assumptions provides timely advice to top executives in the United States and abroad. William Martz specializes in the installation of management systems which include strategic planning, operational management, information systems and organization development. He holds A.B., M.B.A., and J.D. degrees. He has worked with companies in a variety of industries, including service, manufacturing, retail and associations. His market focus has been on the so-called "non-Fortune 500" companies. His list of clients is diverse, ranging from the National Association of Securities Dealers to Eckrich Food Products. The nature of the service he provides is the application of the management process in real-life organizational situations. He uses a hands-on approach, not a consulting report and recommendation method. This approach includes regular monthly visits with clients, spread over a number of years, so that the clients can assimilate management principles and install them as best practices in their own organizations. His service as president of companies in the manufacturing the information services industries has allowed him to offer practical experience, and not just theoretical knowledge. He has conducted public seminars in various parts of North and South America and has co-authored three books on the management process and strategic planning. The key thrust of this self-audit is a look at your business from the outside in! What are the environment's signals to the business for a better fit together? What are the market requirements the company must understand for higher mutual satisfaction? What are the customer needs and wants that must be fulfilled better by the company's products and services? What are the changing profiles of the employees, and are they being satisfied by the company's rewards and policies? Every question, every evaluation, every step must be viewed and acted upon from the outside in, never from the inside out. The company, the executives, everyone and everything in the business must adapt to the changing and challenging outside forces. That's the key to the present and future success of any organization. It's the basic and most important thrust of thinking and action for any organization. Rate your operation fairly, but conservatively. There may be some cases, hopefully very few, where a description of a stroke for a particular hole does not apply to your company's operations. When you read the PRO'S COMMENTS about the proper strokes for each hole of the management course, your immediate and natural reaction may be: These are well-known platitudes; everybody is aware of them—it's nothing new or different. It's a firm grasp of the obvious! Don't rush to these fast conclusions. Reflect on the success ratio of most companies, particularly in recent years. Why so many mismanaged enterprises? Why so many mediocre results? Why so many shoddy products and services? Too many companies are not managed well; too many managers don't follow the obvious! After you compare your own operation against the self-evident platitudes about the various strokes, don't prejudge the golf course as too easy. Reevaluate your own swing carefully, honestly and critically. Compare your performance to other companies, competitors and noncompetitors. Do it on a global basis. Your revised final score may surprise you. It could also lead to many improvements in the way your organization is managed today. Ask your associates to duplicate your efforts, play their own game and score as they see it. If there are many differences, ask yourself why. You may gain greater insight and broader objectivity. 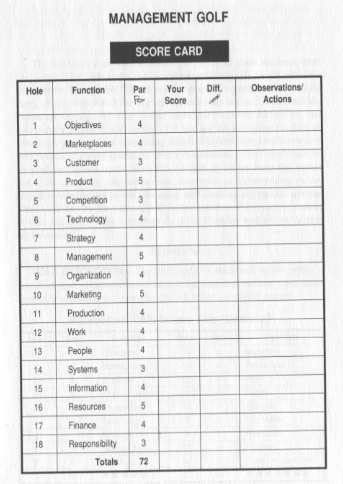 You will also clearly visualize many actions you can take or recommend to improve the company and its operations. Summarize your strokes vs. par for each of the 18 holes and write the numbers in the appropriate places in the table below. Add all the pars, birdies and bogeys to determine the overall score for your company. This score less 72 becomes your current handicap. 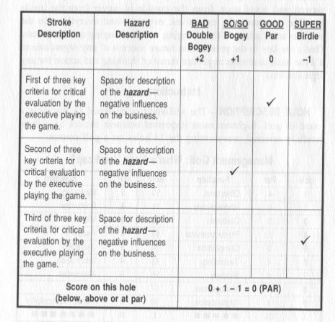 If you rated your company's performance fairly and objectively, after reading the description of each stroke on every hole, you now have your first indication of your overall score in this highly competitive game of management golf. Whatever your score is, there's room for improvement. First, analyze carefully all the holes where you scored above par. Your first step is to devise innovative action programs to improve the situation where it's most needed. The second step is to further enhance your already good performance, where you scored par, to a below-par excellence. If you give people a fish, they will have a meal. If you teach them to fish, they will have a living. If you are thinking a hundred years ahead, educate the people. By planting a tree, you will harvest tenfold. By educating the people, you will harvest one hundredfold.